My friend and CTMH addiction supplier consultant is getting married next Saturday. She's hoping to earn a trip to Thailand in 2017 but, in the bustle of wedding preparations and a honeymoon, she needed some help with inspiration projects on her blog. I'm helping out on Saturdays for the next few months. Since Shannon's last name will be changing to "Baker," she's redesigning her blog around a baking theme. She decided that my part will be as her "Sous Chef" thus "Sous Chef Saturday." I hope you'll head on over to her blog to see the full project and complete list of instructions. 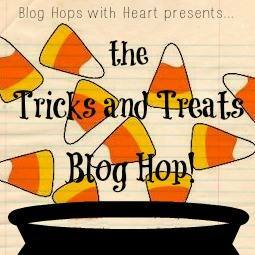 It's hard to believe we are finishing our first year of Blog Hops with Heart. Such a fun group of talented ladies. They have been all treats to work with. Get it? TREATS? I have such fun using the special features of Cricut Design Space to customize images so they do what I want. The original image of the house is from CTMH Artbooking. I used the "Hide Contour" feature to get rid of the outside edge and the hole punch circles. Next, I used a circle shape that comes free with DS and the "Slice" feature to round out the left side. Then, I placed it on my mat so I could cut in the center of a panel. If you have DS, here's the cutting file. Because lining up an image exactly in the center of a pre-cut panel never works for me, I always give myself a larger panel than I need and then trim it down after I've cut the center image. Once the image was cut, I used Liquid Glass to adhere a piece of clear plastic to the back side of the house. I stamped the sentiment (retired set called "Wicked") in black. It's important that you stamp anything you want on the panel before you add the foam tape that creates the barrier for the sequins. I just snipped lines of foam tape and lined up the inside edges so there were no gaps. I meant to take a picture of what it looked like before I adhered everything together, but I forgot. Sorry. Then came the sequins. I used more than I thought I'd need, and I think I could have used more (however, the last shaker card I made I used too much, so...there's that to consider). I forget where I got this package of mixed color sequins, but I love the color scheme. I peeled off the backing of the foam tape and added black cardstock over the top. I used more foam tape to adhere the entire top panel to the card base. Three more sequins on the front of the panel finished off the card. Now I just have to figure out who to send it to. Be sure to visit all the Blog Hops with Heart ladies to see each of the fabulous projects this month. The hop is a circle, so keep going by visiting Wendy Coffman's blog. You should have come from Amie's blog. She also has a list of all the participants, if you end up getting lost along the way. I'm leaving for New York City in a few hours. Back in July, I won a trip for two that includes airfare, tickets to The Met, and a two-night stay. Hubby and I decided to extend by a couple more nights and purchased tickets to see Phantom of the Opera. I'll also be meeting with my editor who will be giving me a tour of Kensington Publishing and taking us to lunch. (I feel so swanky!) I wanted to take her a set of note cards as a thank you. 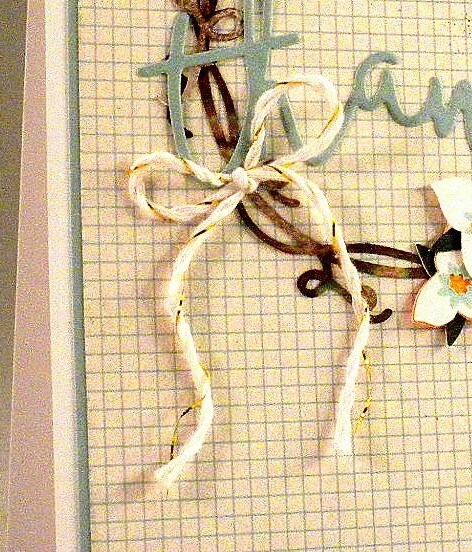 This card uses mostly retired CTMH products with the new Flower Market Cricut cartridge. The paper colors are New England Ivy, Petal, Twilight, and Heavenly Blue over Timberline woodgrain; the twine is Glacier; ink is Pacifica and White Daisy; and the sentiment is from the Artistry Cricut cartridge coordinating stamps. The banner was cut using MFT's stitched die cuts. The flower centers are from Altenew's Vintage Flowers. I'm entering this in Heart2Heart's Woodgrain challenge. Time to finish packing...and the laundry. Which I already did this afternoon before hubs came home and informed me he needed his jeans washed. Yeah...they were on the floor in his office instead of three feet out the door in the laundry room or in our bedroom inside the hamper. It's a good thing I'm in such a good mood about this trip or I might just leave him behind. I am waiting for edits to come back on my last story of the year. Yes, folks, after four straight months with deadlines, I'm down to edits on the last one!! I also just received my author copies of my latest release called The Blue Ribbon Brides Collection. To celebrate, I spent some time in my craft room with my Cricut and CTMH Flower Market and Artistry cartridges to make invitations for Thanksgiving dinner. This used a boatload of supplies, all current CTMH. I hand-drew a mask on a sticky note, cut it out, and covered the center of the pumpkin. I used Cocoa ink to LIGHTLY sponge around all the edges. I switched out the masking to sponge the center with Saffron ink, then went over the Cocoa sponging with Saffron to blend. Because the trillium cuts were so small, I left them on the mat so they didn't fly away on me while I stamped. Note: The trillium flowers are not all the same size, so be sure to select the correct size of the Tangerine cuts that back this and fill in the center. The sentiment is part of the With You stamp set. I used my Micro-tip scissors to cut the "Count your Blessings" stamp in two so I just had "Blessings", and then bent the stamp to follow the curve of the banner. Below shows how I trimmed off part of the banner and also shows you another sentiment option from the Flower Market trio of stamp sets that come with the cartridge. If you have Cricut Design Space and own the Flower Market and Artistry cartridges, here's the cutting file. I strongly recommend using a German Carbide blade...no, I take that back...don't even bother cutting this unless you have a German Carbide blade. I also recommend you don't go much smaller than this size. It will fit into a 5x7 envelope if you are careful about positioning the center wheat stalk so it doesn't stand too tall. To make this into a card, I simply cut the background pumpkin shape a second time, scored it, and glued it to the back only at the top portion. If you are going to stamp the inside with a sentiment or invitation, might I recommend that you do your stamping BEFORE gluing it to the front. Yeah...ask me how I know that one. I didn't bother to hide the bits of wheat stalk and hydrangea flowers that showed through. I figure, if someone is going to get upset about a little crafty goodness showing through, they don't deserve something this great. Okay, I'd better go back to work on my edits. Story is due on Monday and then the hubs and I are off for our big trip to NYC.